Safe, quiet, great neighborhood; 1920’s renovated architecturally beautiful home; Apartment is furnished with 3 high quality queen beds as well as a quality twin air mattresses if needed, quality linens, down comforter, towels, dishes, stainless steel cookware, furnishings are comfortable largely French antiques; Garden landscaped with ginger, palms, camellia, night-blooming jasmine, sweet olive, wisteria, herbs, potted plants; Responsible landlord who addresses issues/fixes rare problems immediately; new electrical, plumbing, appliances, paint, bathrooms, etc. Home is the half of a historic renovated double shotgun. You can email or call with any questions. The place was a great to stay, we came for my sons wedding. We bought our 2 dogs and really enjoyed walking the neighborhood. It was blocks to the park, and beautiful homes. It was quiet and safe, the home had a ton of antiques. The owner was great very responsive. We would stay here again. So glad you enjoyed your stay! We hope you can come again! This house is really a lovely home- very clean, comfortable and well maintained. Although our party was 5 people and we were not well known to each other and it is a shotgun house, the arrangement of the property meant that there was no issue with privacy (particularly as there is front and rear access). We found the area another feature which we all really enjoyed. Although we were attending a meeting at the Convention Centre, the local area is far more entertaining and we returned to visit local restaurants and bars most evenings. There are several very friendly bars nearby where we enjoyed speaking with locals and an excellent range of restaurants. We particularly enjoyed Pirogues for a drink and The Half Shell On The Bayou restaurant for Creole food. Whilst it's still there, you should also visit Kitchen Witch Bookshop if you're interested in cooking (or even just their homemade spice mixes). So very glad you enjoyed New Orleans, our home, and are great neighborhood. I hope you can visit again! The property was as described. The garden patio area was nice. It was the first time experiencing a shotgun-style home for us, and I feel it is better suited for families than two couples. It had too much furniture and there were some cleaning issues, but overall satisfactory. Nice comfortable house. Good location for our purposes. House clean and easy to sleep a lot of people. A little cluttered with multiple dining chairs and tables all over. I have never done VRBO before and did not know to bring paper towels and trash bags. Made a run to grocery, no problem. 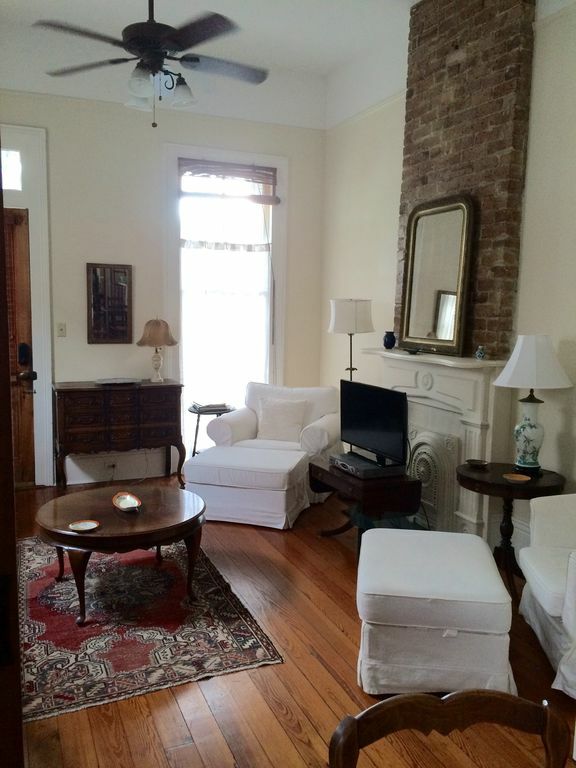 The property was cute & convenient to everything we needed and close to everyone we saw in New Orleans! Mya made our stay wonderful and is super responsive. Thanks so much Stacy! I’m so glad you all had a nice time at my home and in New Orleans! The home is on a quiet street with ample parking. The beds were very comfortable and it was great having two bathrooms. We did not cook, but the kitchen was well appointed if we had wanted to cook. Myra was readily available if we had any questions or concerns. Several blocks away there is a lovely museum, historic cemeteries, City Park, Bayou St John, botanical gardens, a sculpture garden, etc.